it took us weeks to notice what was missing from our lives…and it was a strange thing: noise.We had moved to a suburb that was under construction, so there were very few houses. And when the construction crews went home at night, it got quiet. Too quiet! We had been used to traffic sounds, but what we eventually realized we were really missing was the sound of sirens. Being at the east end of Jasper Ave, they were pretty common. And then one night, when we heard one in T-Towne, we went “Ahh, that’s what’s wrong here!” Eventually, T-Towne grew, and though it was still a pretty quiet place we regularly heard ambulances, and firetrucks, and police (in various modes of transport…particularly Edmonton’s hotly debated Police One helicopter) nearby, just like any other city. This became a normal sight over the city for a few days...but now they seem to have moved down river to places like Griffith as they prepare for the water to reach those towns. 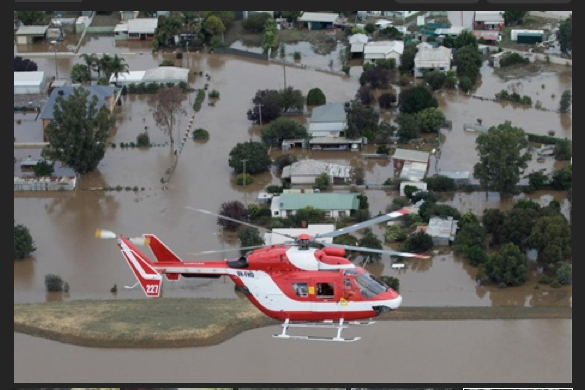 The last one over the city was probably the one touring Prime Minister Julia Gillard over the flood zone today. Kooringal, our Wagga suburb, is pretty quiet too. We are at the end of a cul-de-sac, so there is little traffic. And even though our rental house backs onto Kooringal Road, a major thoroughfare, it isn’t ‘major’ in the bigger picture; a busy road here is still pretty quiet. But with the floods here this week, traffic got heavier. Not road traffic really, because Kooringal Road was closed at the north end; other than trucks bringing in sand bags, there wasn’t much ground traffic. What we had was air traffic: there were helicopters over Wagga! Might not seem like a big thing, but the first ones we heard made us realize how quiet the skies are here. We were used to the Edmonton police chopper, the media traffic choppers, corporate helicopters, and air ambulances (the latter more for Dan, who worked right near the hospital). They were just normal. But when the first one cut through the silence here, it startled us. As the crisis continued, it became commonplace again – maybe even comforting. We’re not sure exactly whose helicopters they were; some were SES, maybe the Rural Fire Service had some, maybe military…all these groups have banded together to various degrees to go a great job protecting the people of Wagga. Some might have also been media, as the floods have been getting a lot of coverage around the country. We used to drive past this pub daily on our way to work. And our friends in North Wagga live about 2 blocks from it; they and their animals were evacuated, but their house is now under water. And while we found the helicopters commonplace, they were also a constant reminder of what was happening. Our city was under siege from the river. We were never in danger, as our house is on a hill. 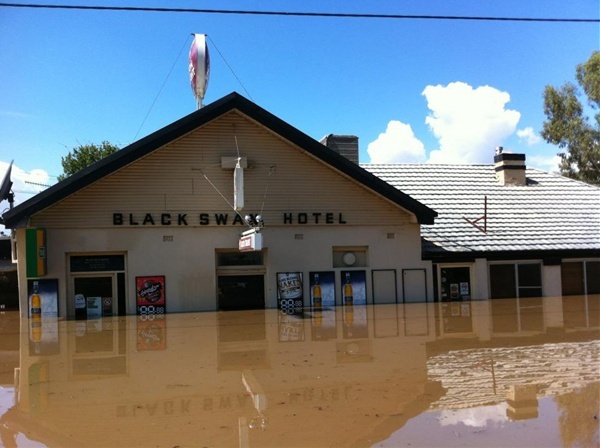 But a huge portion of it – North Wagga – is currently under 3 feet of water. We know people who live there, who will probably return to a nightmare when the water subsides. Their house is two storeys high, and their main living area is upstairs. But the ground floor will be muddy, their pool table will be ruined (hopefully they got the stereo and some really rare vinyl upstairs before they left! ), their swimming pool will be full of sludge…we assume they have their dogs with them, and we know they have boarded their horses somewhere safe…their chooks…we don’t know. Other people we know in central Wagga fared better. Few were in the evacuation zone, and the ones who were had somewhere to go (including our house). And after only 2 nights away, they could go home, whereas the people from North Wagga are in limbo. The water level in the river reached 10.56 metres, which is about 24 cm lower than predicted. And the levee held. There was fear that the levee would be overtopped, but more fear that it would be breached – that it would collapse. If that happened, it would send a wave into central Wagga, probably wiping out more of the levee as it went, and flooding a lot of land really quickly. The pre-emptive evacuation was because the SES thought if the levee broke, the city would be flooded in 3o minutes. From the bottom of the river to the top of the levee is 11 metres. In the 3 or 4 blocks up to Baylis Street, the main street in the east side of downtown, it is a 3 metre rise. So think about what would happen in the situation below, as things were yesterday, if the levee gave way: Yes, a lot of water would rush into the city. We don’t know the height difference between the top of the levee and the level of Baylis, but our ‘flood refugees’ said that if the levee were to give way, their house 2 blocks south of Baylis would probably get about 60 cm of water. 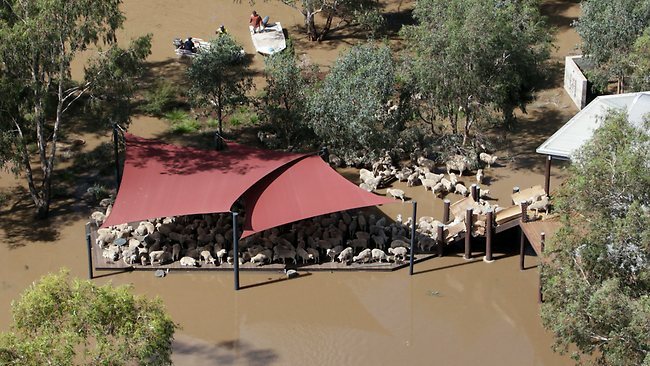 That means that the lower part of central Wagga would be under almost 4 metres of water. In that low spot, just south of the levee, are places like Wagga Thai, a great little restaurant. And Duffy Brothers fruit and veggie shop, and Blake Street Meats. Think about it…almost 4 metres of water…Wagga Thai would be full to the ceiling and then some. There would be water on the second floor of hotel rooms at The Lawson. There were photos in local media of farmers rounding up sheep in their boats and ferrying them to this deck. We assume it is the back of their house. When we see pictures like this, it is hard to even understand what we are looking at. Landmarks like roads and the river no longer exist...it is just a blur of water and rooftops. And then there is the really really really (really) weird aftermath: how the flood has affected the spider population. 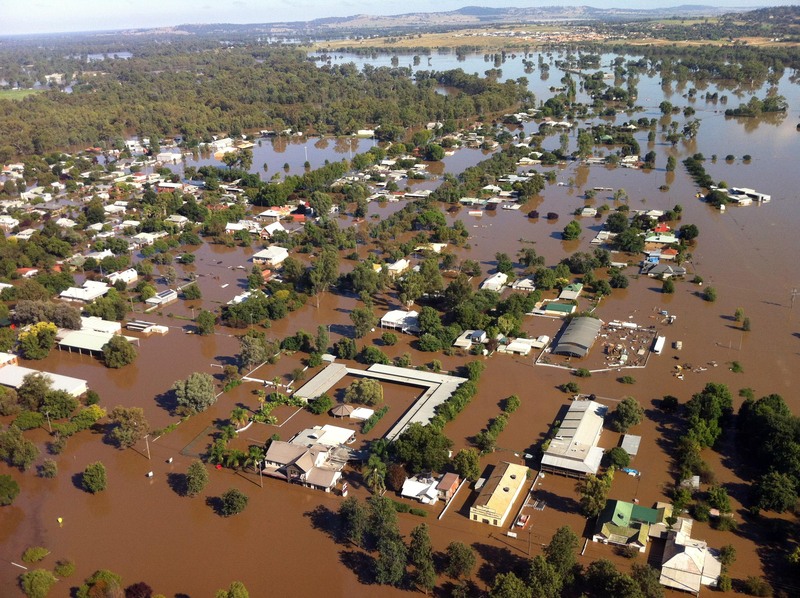 Yes, the spider population in Wagga has reacted to the flood by…well, we can’t even describe it so we will just suggest you read this. Please do read it (apologies to those who are squeamish). It is fascinating! We’ve seen a bit of this phenomenon, but nowhere near as much as the photographer for the story. This entry was posted in farming, floods, rural life, spiders, Uncategorized, wagga, wagga wagga, wineries. Bookmark the permalink. Was your part of Oz experiencing a drought not too long ago? If I remember correctly parts of the country were when we were there for ISIC? Climate change (whether caused by or contributed to by humans) seems a rather frightening reality… Take care! Hi Julie – Dan here – when we were here for ISIC (what was that…2005 or so…I still remember that great evening at the Italian restaurant!) there was a drought. We’ve heard a lot about it though, as it had quite an impact on this region. But it seems to have ended in the (southern hemisphere) spring of 2010, and when we were here in Dec of that year there was a flood! And again now. I had wondered where all those creatures end up after a flood. Be well cousins.